Although Tuscany is not an off-the-beaten-path destination, it is still possible to find some hidden treasures in this well-trodden region of Italy. One of such places is the hermitage of Montespecchio near the picturesque medieval town of Murlo and less than 40 minutes by car from Siena. In the south of the Siena province lies a green forested valley, Val di Merse, with very few houses in sight. I had visited this area with a local previously and enjoyed the surprising quietude and isolation, so I decided to come back. I drove slowly knowing that nobody would beep and try to overtake sending an annoyed Italian hand gesture my way. There was hardly anyone on those Tuscan roads, just a few deer that I spotted between the trees, yet the phone signal was good and Google Maps helped me navigate the narrow roads. After a short drive, I left the car and continued on foot. An old dilapidated sign confirmed that I was heading in the right direction. The path went through a dense forest of gnarly trees covered with moss and lichens. I was busy watching my step as the track was eroded and soil crumbled under my feet. Google Maps announced that I have reached the destination. I lifted my head but, for a moment, all I could see were trees and rocks. After a few seconds, as my eyes adjusted to the play of sunlight and shadow my heart skipped a bit. 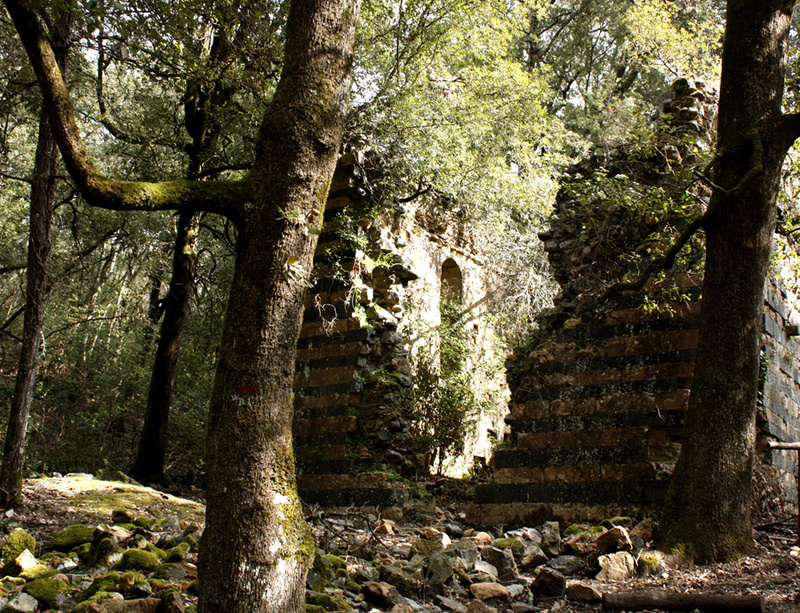 There it was, like an apparition, hiding between the trees, in ruins but still breathtakingly beautiful: L’Eremo di Montespecchio, or the Conventaccio as locals call it. Built by monks of St. Augustine’s Order in 1192, the monastery was a showcase of local materials and their craftsmanship. The monks managed excavation and sales of the famous “black marble of Vallerano”, as serpentine was called back then, found in the caves nearby. In medieval times, the black marble from the area was in high demand for decorating churches around Italy and the hermitage prospered in the 13-14th centuries. It became one of the largest Augustinian monasteries of its time, but only a few foundation stones and four crumbling walls of the once striking church remain today. The church’s exterior was constructed in alternating stripes, like those of the nearby spectacular Siena Cathedral. However, instead of white marble used to build Il Duomo di Siena, the monks used a stunning local salmon-pink stone. 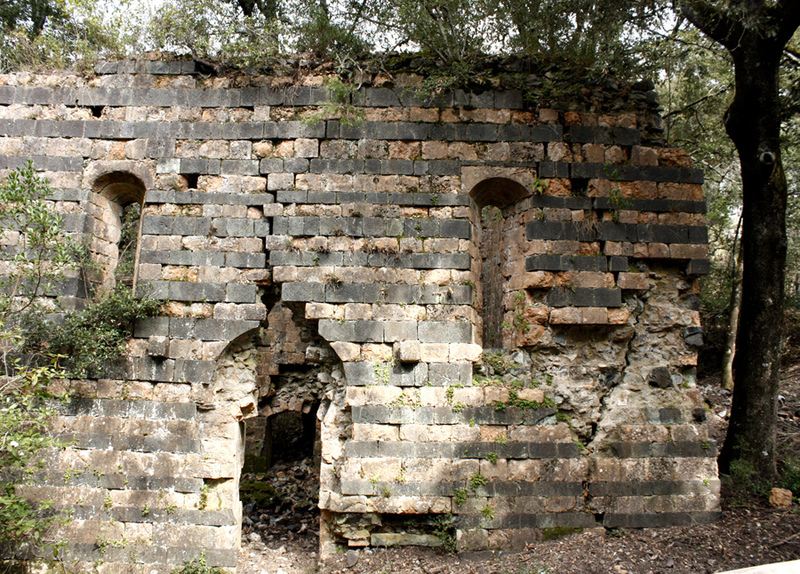 Standing there, in front of those glorious ruins, listening to shy chirping of birds and gentle murmur of a stream at a distance, I could easily imagine how magnificent that church was in its glory days: arched windows, traces of pilasters, holes on the walls where, perhaps, devotional paintings had been attached. 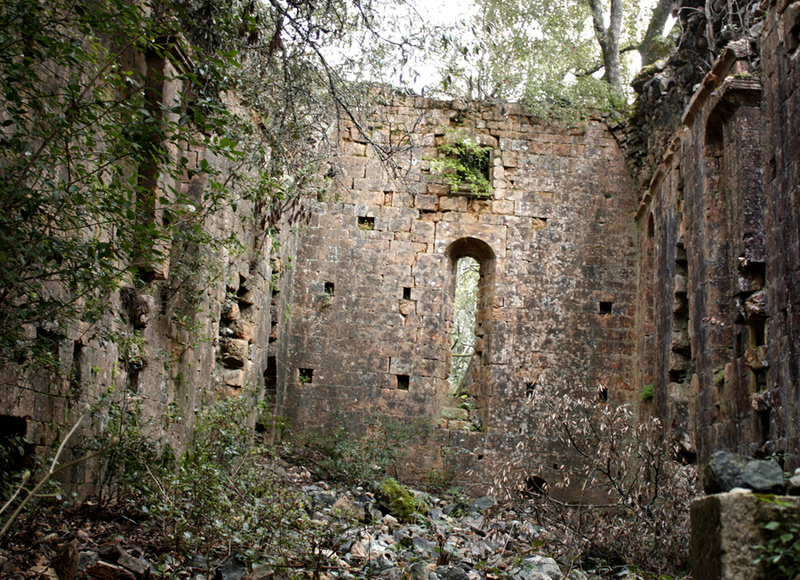 The hermitage was always hard to reach and a document from 1650 describes it as located in the middle of thick scrub and bush. Later, while doing research online I also found a photo of an 18th century drawing depicting the Conventaccio still standing, with other buildings around, the walls and roofs intact. On the drawing, there was a visible path, known to locals as the secret “strada dei Frati”. They say, the monks from the monastery used it to reach the bishop in the castle of Crevole, some 10 kilometres away, to avoid bumping into others. Some local enthusiasts have walked that route and say that there are still traces of the secret trail, which, nowadays, is mostly used by wild boar and deer. 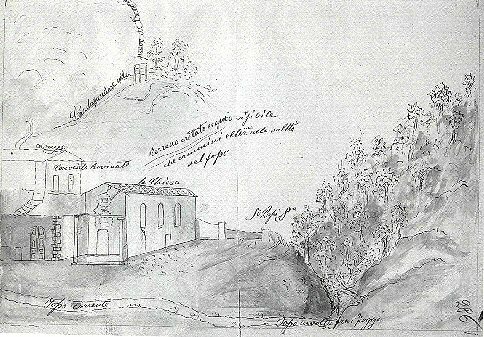 The Hermitage of Montespecchio in a nineteenth-century copy of a seventeenth-century drawing. Siena, Municipal Library MS A. VIII 53, fol. 286 r.
After a while, it turned out that the site was not suitable for such a manmade wonder and it slowly started sinking and sliding under the weight of the buildings. At the end of the 17th century, the monastery was abandoned, very likely to the delight of the monks, who, as a surviving from those days document states, were tired of being so isolated. 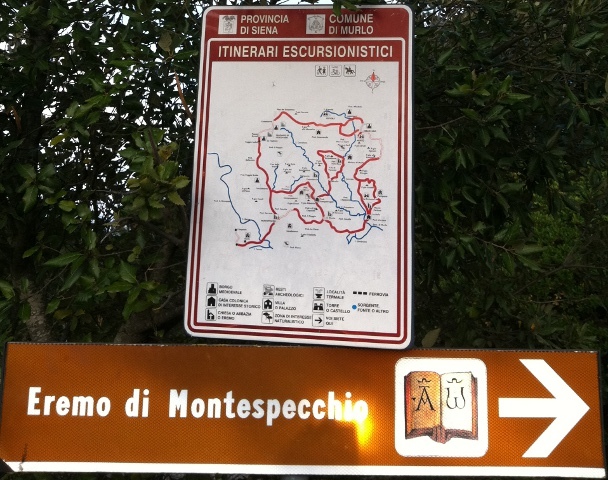 To find directions to the hermitage enter “Eremo di Montespecchio” in Google maps. You will have to leave the car at a certain point and walk for about 15 minutes. If you are feeling more adventurous, there is also a walking trail from Murlo. To find a local English-speaking a guided walk, talk to the Proloco Murlo.